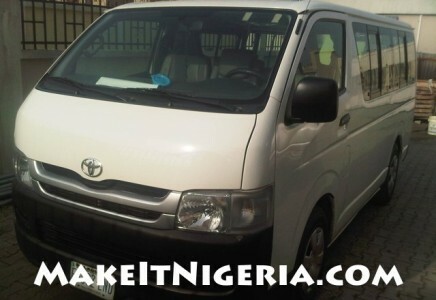 Check Out our Air-Conditioned, Dependable, Chauffeur-Driven Car Rental / Car Hire Services in Nigeria (Lagos, Ibadan, Ogun State, Osun State, Oyo State & Beyond) with Airport Pickup & Drop-Off Service. With us, our drivers are a cut above the rest when it comes to safety, honesty, dependability and impeccable customer care. Comes equipped with: Air Conditioning. 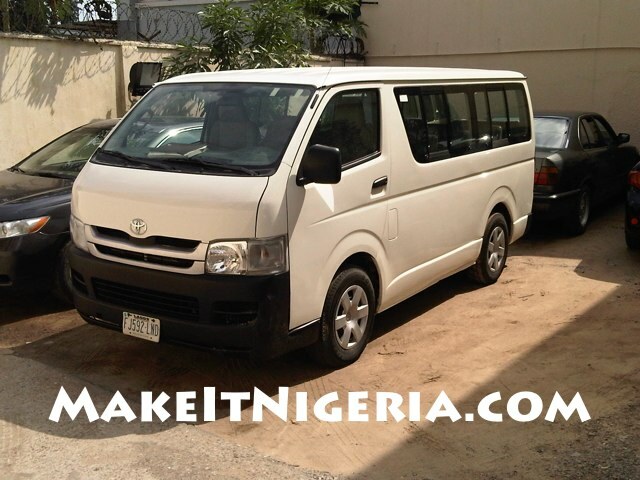 This 14 Passenger Toyota Hiace Bus also includes Power Steering, Tilt Steering Wheel, Power Locks, Power Windows, Side Airbags, Driver Airbag, Passenger Airbag, AM-FM, CD Player, Passenger Airbag. Use of the vehicles beyond 8:30pm will attract a N1,500 night crawler surcharge for each hour the vehicle is used beyond 8:30pm. We will provide you with a trustworthy chauffeur with the rental. For customers requiring airport pickup service, there is a $50 refundable deposit requirement. This deposit is not refundable ONLY if you do not honor your reservation. In the past, we have had customers making airport pickup reservation, our chauffeur shows up at the airport as scheduled as then, the customer never show up. PEAK PERIODS (if applicable), apply to bookings that fall in between APR 1 thru AUG 31 AND DEC 15 thru JAN 15. 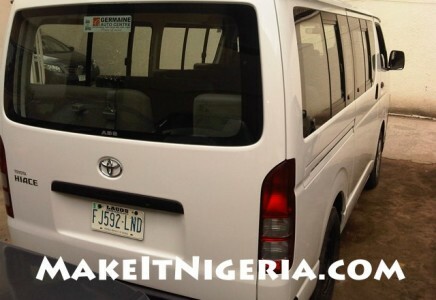 PLEASE NOTE THAT OUT OF TOWN SURCHARGE APPLIES FOR USE OF THIS BUS OUTSIDE OF LAGOS.